Have been looking for a good compact semiautomatic rifle to use with a thermal scope for hogs. This in 300 Blackout fits the bill. Excellent bullpup rifle! Particularly in 300 Blackout. 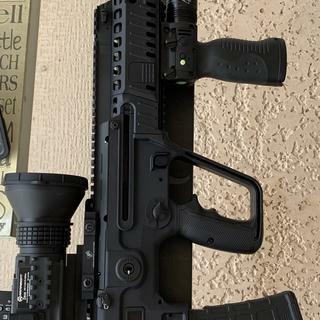 Always wanted to try a Tavor and when I saw the 300 Vlackojt model it just cried out to me, “buy me now!” So just for be record I love this Gun. The pop up iron peep sights are great at 25-50 yards and after putting my thermal sight on it I’m get about 2-3 MOA at 100 yards. Now my background is LRPS, so 2-3 MOA at 100 takes some adjustment but is well within the rifles intended use. I did fork out another $350 and put a Geissele trigger module on it that made a world of difference. I’m contemplating sending the barrel out for cyro treating just to see it it improves a bit. The rifle has reliably feed everything I’ve put through it from light copper Bullets to heavy subsonics without a hitch. I love the ability to switch but do wish there was a place on the rifle to store the necessary tool. It is heavy but carries and shoulders well since it is so compact. I put a vertical fore grip on it with laser/light combo and that works well. Looking forward to some coyote hunting in the near future. Coyote hunting rig in the near future. Great balance, Runs great suppressed. Already had the 556 version so why not get the 300BLK? It functions great suppressed, very little if any gas in the face., very well balance. Only thing I didn’t care for is the new style charging handle. 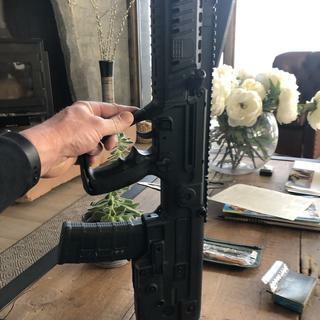 My 555 rifles had a simple straight-back charging handle, while this new version had an articulating handle with a barrel clamp that apparently helps provide extra torque when unlocking the bolt. I simply removed the new style handle, installed a spare straight charging handle and called it a day. Great purchasing experience ! Gun speaks for itself and lives up to the great reviews. Thanks to a decade of collaboration with Israel Defense Forces and research and development teams, IWI Tavor XB95 Semiautomatic Tactical Rifles feature the ultimate bullpup configuration – at home in open-field shoots and close-quarters engagements. Updated model includes several new features. Fire control pack with a 5- to 6-lb. trigger pull. Repositioning of the ambidextrous mag release to an AR15 location. Forearm with Picatinny rails at 3, 6 and 9 o'clock positions with removable rail covers. Relocation of charging handle. Modular Tavor-style pistol grip. Smaller low-profile bolt-release button. Also maintains several features from previous models. Ergonomic construction for ease of use. Long-stroke gas piston is clean-cycling for reliable operation. Cold-hammer-forged CrMoV chrome-lined steel barrel to prevent corrosion. Ambidextrous configuration and operation is friendly for any shooting enthusiast. Field stripping to service the subassembly is easy. All metal parts are treated for corrosion resistance. Integrated rubber recoil pad.